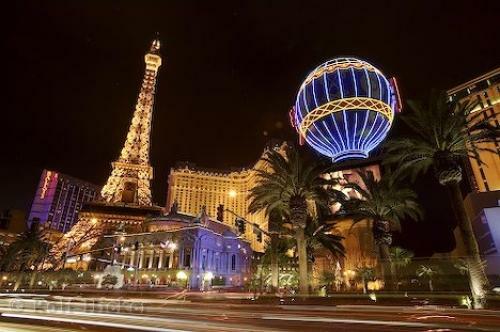 One of the elaborate hotels along the Strip is Paris Las Vegas. Photo of a few of the hotels along the strip in Las Vegas, Nevada in the United States. ... You can enjoy fine restaurants, first-rate shows, casinos, shops and galleries. Las Vegas, Nevada is a place like no other and it is a fun filled city of excitement where you can enjoy a fast paced vacation.Paris Las Vegas, Eiffel Tower, Vegas Strip, Las Vegas, Nevada, USA, North America. I photographed this photo with the digital SLR camera model Canon EOS-1DS, aperture of f/14.0, exposure time of 5/1 sec. on ISO 100, as always I used a original Canon Lens, the focus lenght for this picture was 20mm.